When my friend John gave me two Mark Bittman cookbooks (I retaliated by giving him the Dean & Deluca cookbook and Jamie Oliver’s Naked Chef), I was looking forward to expanding my stylistic horizons through The Best Recipes in the World. Needless to say, John nearly fell over laughing when I told him that the first recipe I tried from the cookbook was… French. Gee, way to wander from your norm! Well, I didn’t have bloody pasilla chiles lying around John!! (but boy that recipe looked good), however I did have lentils! This dish is like the classic daubes I learned to make from Julia Child’s Essentials of French Cooking years ago, only simpler. I changed Bittman’s recipe a fair amount to suit my purposes, but I’ll definitely credit the cookbook for reminding me of this great dish I haven’t made in a while. I called it a “drunk” braise because you sacrifice a bottle of red to the cause! Heat some olive oil in a dutch oven over medium high heat and sear your lamb for about 20-30 seconds each side and remove to a side plate. 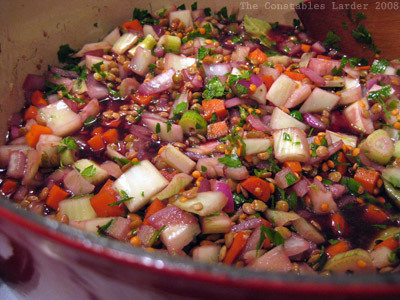 In your dutch oven, bring the heat down to medium-low and saute your chopped onion and garlic until the onion starts to turn translucent, and then add the chopped carrots, fennel, parsley, lentils, bay leaf, half a tsp of salt, a few grindings of pepper, and the bottle of wine and turn up the heat until it is bubbling. Nestle the lamb into the mix, cover, and place in the oven for 3 to 3.5 hours. Check the pot every 45 minutes or so and very gently stir. Flip the lamb halfway through. If it is simmering a little too hard at any point, lower the heat another 15F. If the dish starts to dry out (you want it to be nicely moist), add water. I would estimate I ended up adding about a cup of water. It is also important to taste for salt — too much will ruin this dish, but too little will leave this quite flat. I served by removing the lamb to a cutting board, and shredding the meat with two forks. 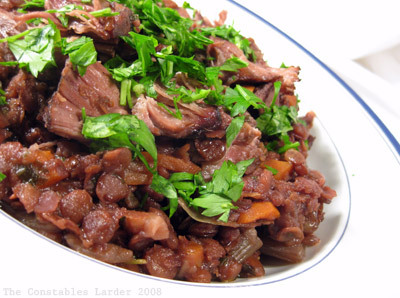 I then layered it on top of the lentils and vegetables, topped with some fresh parsely. This goes well with a red wine with some body, or a dark beer. So that’s the normal recipe. In full disclosure, I’ll note that in this particular case, I started it two nights ago and cooked it for two hours (it wasn’t going to be done in time for dinner that night), and then placed in the fridge until I was able to finish and serve it tonight. Not wanting to put my dutch oven in the fridge, I shifted everything carefully to a deep baking dish. Tonight when finishing the cooking process, I didn’t want to make more washing up so I left it all in the baking dish, covered that with aluminum foil, and cooked it for another hour and a half tonight at 280F. I love slow, low heat cooking probably more than anything. It sometimes drives Lisl nuts when I create a two-color-palette meal, but I clearly have a tendency in that direction, as evidenced by the above photo. Today I got away with not having anything green on the plate! Granted that time for both of us was limited, but still there was enough to put together a decent meal. This meal came about because the local butcher, the owner of an excellent store called Crisfields, sold me on a cut of what he called “super chuck” (once he starts pitching me on something, I usually fold like a house of cards). The steak was a 1.5 inch think cut of chuck, shaped not unlike a typical brisket cut, but with much more marbling. Heat a few tablespoons of olive oil in a dutch oven on the stove top on medium-high heat. Salt and pepper both sides of the beef and once the pot is hot, sear on both sides for a minute or two either side. Remove and set aside. Chop up a yellow onion and 3 or 4 garlic cloves and saute in olive oil over low heat for a few minutes until onions start to turn translucent. Take 3 celery stalks and 4 peeled carrots, and put them in a food processor and pulse until very finely chopped (I wanted the flavor but not extra chunkiness, hence this step). Add to the pot and saute for a few more minutes. Add two tins of Italian skinless tomatoes and about half a cup of wine (in this case I used white but red would do). I think I added about two teaspoons of salt, a bunch of ground pepper, bay leaf (or two) and a nice handful of fresh oregano. Once this is all simmering for a bit, break up the tomatoes with your spatula and nestle the beef in the sauce. Spoon some sauce over top to make sure there is moisture on all sides of the beef. In my case, I didn’t have the ability to start this recipe during the day, so I put it on when I went to bed the night before, and set the oven nice and low at 225F. In the morning I spooned away some of the melted fat, moved it all into another container, and placed in the fridge. That night after work, I put it back into the dutch oven, got it simmering again on the stovetop, added salt and pepper to taste, tossed in some more oregano, and left uncovered in the oven at 250F for another hour or two. 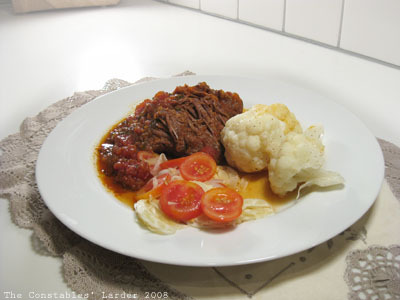 This ended up delicious and flaky, but so rich that I decided to serve it with some cauliflower, simply steamed, to have a healthy but neutral addition, and then whipped up a tomato and fennel salad to add a bit of acidity. This was probably my last braise for a little while, given the rapidly rising temperatures. I sliced the cherry tomatoes into 4 slivers and placed in a bowl. The fennel bulb I washed then sliced as thin as I could with a sharp knife. Because I didn’t have a mandolin to cut it really fine, I decided to soften the fennel a touch by steaming it for about 2 or 3 minutes, then adding to the bowl. I dashed some olive oil, rice vinegar, salt, pepper, and lemon on top to complete. P.S. I’m not going to give myself awards for food photography any time soon, not least because I am usually hungry so hurry it along, but it was nice to discover that I could manually set the white balance on my little Canon digital, and that helped remove the orange cast I was seeing with night shots. I can always aspire to be like Aun, a high school friend, who takes the dreamiest pictures of food ever.